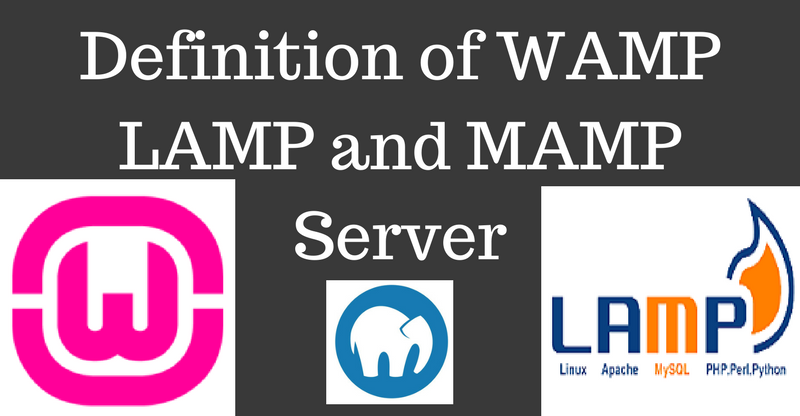 WAMP server एक Free Open Source Application हे | WAMP Server Microsoft Windows Operating system के लिए बना हे | WAMP Server के अंदर एक से ज्यादा Application का Combination हे जिनका नाम हे Apache, MySql, Phpmyadmin, Php, Perl, Python. WAMP Server Windows के operating system के लिए Web Server environments को बनाता हे. Wamp server web server environments इस प्रकार बनाता हे कि Wamp एक windows ऑपरेटिंग सिस्टम के लिए हे, Apache एक web server हे, MySql एक Database Server हे, Php/Perl/Python एक PHP Scripting language हे और PhpMyAdmin MySql Database मैनेजमेंट application हे. LAMP server एक Free Open Source Application हे | LAMP Server Linux Operating System के लिए बना हे. Lamp Server के अंदर भी Linux, Apache, MySql, Php का Combination हे जो सिर्फ Linux Operating System पर ही install होता हे. Wamp Server and Lamp Server दोनों का work एक हे. सिर्फ install अलग अलग operating system पर होते हे. MAMP Server एक Free Open Source Application हे | MAMP Server Mac Operating System के लिए बना हे. Mamp Server के अंदर भी Mac, Apache, MySql, Php का Combination हे जो सिर्फ Mac Operating System पर ही install होता हे.